Today’s snippets will be from my WIP, Eitlean: Book Three of the Daearen Realms. Eitlean is written from Banee-Belle’s POV, and she has become one of my favorite characters I’ve ever written. Whatever you’re impression of her after reading Bienn-Theine, you have no idea, and I can’t wait until she’s ready for you to meet her. She’s fun, saucy, sassy, loves herself, loves her body, kind, smart, fierce, and gregarious. Warning: By the time this is published, none of this will look the same. Just the way it works. Tesbai: A cross between three Japanese war fans; Tessen, Gunsen, and Gunbai. 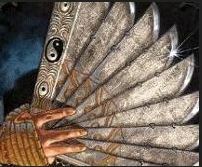 A Tessen was the same size, shape, and works like a normal fan does, made from heavy plates of iron used by Samurais. A Gunsen was a lightweight Tessen and was used as a fan by soldiers. A Gunbai is a larger, but solid wood and iron fan that doesn’t close. A Tesbai is sized like Gunbai, about the length of a broad sword but, opened and shut like a Tessen/Gunsen. Each plate of the Tesbai is samurai sword sharp on both sides, and the tip would run a foe through before they even felt it. With a twist of the wrist and pressure from fingertips the Tesbai’s shape will change, by opening, shutting, changing the angle of the blades, or separating the spokes. “Is part of your technique intimidation? ‘Cause you’re starting to scare me Sis.” Beathan got into position and held his broadsword with both hands. I smiled. We circled each other for a turn and then Beathan attacked. I kept my weapon closed and met each swing with one of my own. We went on for a couple of minutes. I let him draw first blood, a small slash on my thigh. As expected, he grew cocky. It was time. Right, left, right, he was so predictable. I backed up. He thought he had me and used his entire body to spin and land what would be a killing blow. When his back was turned, I moved my thumb, my fan opened, and I blocked him. He bounced back, a confused look on his face. I advanced, moving my fan in a figure eight motion, he had no opening. His eyes were frantic trying to follow the fan. When he was appropriately disoriented, I shifted my weight, used the down swing to propel myself into a spin, the upswing to add strength and speed, and brought my tesbai down at the correct angle to cut his sword in half. He looked at his ruined sword dumbfounded. I switched the angle of the fan on the next turn around and hit him with the flat side. He went flying and landed on his back several feet away. I leapt and used the tesbai to propel me further, midair I applied the right pressure, moved my fingers, and split the fan in the middle. I landed with a foot on either side of his body and slammed the fan into the ground around his neck. So there you go, a couple hints about Banee and she’s so much more!